At BRO Men’s Fashion we strive to provide you with the hottest fashion trends of today. And what better way to stay up-to-date than with a new brand? Allow us to introduce the latest addition to our BRO collection: OAS. OAS is a Swedish beachwear brand that promotes the feeling of vacation all year long. Sweden is known for delivering high-quality goods, and OAS definitely lives up to that. Aren’t you tired of walking around in the same swim shorts as everyone else? 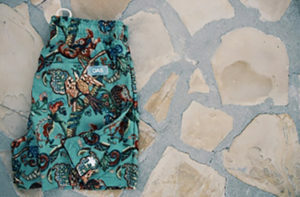 Lucky for you, OAS swim shorts come in such unique prints, you’ll be sure to stand out. The shorts dry quickly and all have two front pockets, one back pocket, an inner lining and zipper. What’s the best next thing to flip flops? Espadrilles of course! And OAS’s espadrilles are perfect for Curaçao’s island lifestyle. Their vintage look go extremely well with the swim shorts and more importantly, they’re comfortable. Whether a day out on the beach or a stroll through the city, OAS makes you a true BRO! Come visit one of our stores to check out the new OAS collection, we are happy to assist you.